There are still few studies which tried to examine firm-level and geographic characteristics as the determinants of export propensity simultaneously. Therefore, this study is trying to investigate what kind of characteristics that is really matters in influencing exports propensity in manufacturing firms in Indonesia. 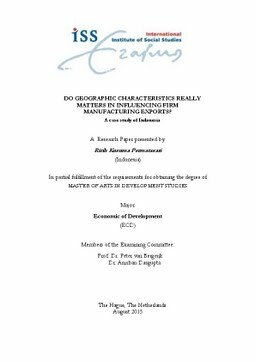 This study, specifically, focuses on the role of geography characteristics in affecting likelihood of a firm to export. Thus, this study attaches the micro and macro data obtained from Central Bureau of Statistics of Indonesia (BPS) for the period 2012. Foreign ownership, total capital stock and productivity of a firm are chosen as firm-level variables. While, surface area represents first-nature geography; and location, export spillovers, education, population, electricity, road density and home market effects represent second-nature geography. All of those explanatory variable are analyzed by using Probit and Logit test. By analyzing Goodness of Fit test and Odds Ratio, this research finds that geographic characteristics really matters in affecting export propensity rather than firm-level characteristics. Second-nature characteristics, which represents by location, education, export spillovers, and road density, holds an important role compares with first-nature geography. Hence, some policy recommendations are applied to improve those kind of endowment factors of a region to enhance export performance.